Homeowners fight over temperatures in their homes and have rooms that go unused for long periods. Now you can save energy and control temperatures independently in up to eight separate zones, with a single outdoor unit. 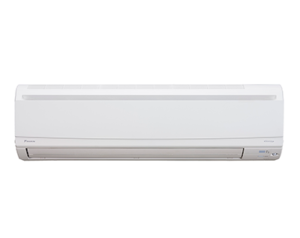 With available wall-mounted, concealed slim-duct, ceiling cassette, and floor-mounted indoor options, Daikin Multi-Zone Systems offer multiple indoor unit styles to meet all home comfort needs. Great installation flexibility and a wide choice of styles. Wide range of outdoor units to which up to 8 indoor units can be connected. All indoor units can be individually controlled. The discrete, robust outdoor unit can easily be mounted onto a roof or terrace, or simply to the outside wall. It is possible to combine different types of indoor units. Daikin indoor units offer maximum personalization with room-to-room air control and various unit options. Whether it’s a floor mount, ceiling unit or anything in between, these indoor units easily connect to a single outdoor unit. FTXS/CTXS Multi-Zone Indoor Unit offers a feature-packed, intelligent wall mounted system that includes intelligent eye for energy savings and horizontal auto swing outlet fins for 3-D airflow comfort. 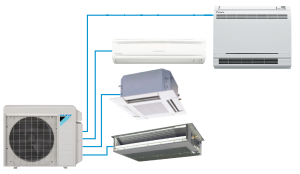 All Daikin multi-split systems have a single, small outdoor HVAC unit. Multiple-port outdoor units connect to various indoor units, creating the opportunity for truly personalized air and are ideal for multi-room applications desiring individual room comfort in a space-saving design. With the ability to connect two, three, or four indoor units to a single outdoor unit, over 1,000 combinations are possible with the choice of wall mount units, slim duct units, ceiling cassette units or a combination. Systems offer energy efficiency levels up to 18.9 SEER and 12.2 HSPF for enhanced home comfort and energy savings. Suitable for both new build and renovation projects, Daikin Multi-Split Systems are the smart, reliable solution for your home. LV Series Wall Mount Single-Zone Heat Pumps offer a feature-packed, intelligent wall mounted system that includes intelligent eye for energy savings and horizontal auto swing outlet fins for 3-D airflow comfort. With up to 24.5 SEER level, LV Series has been awarded the ENERGY STAR® Most Efficient Mark in 2017. Contact A.J. Michaels today to discuss your residential ductless HVAC needs.